These four Minton Gold Ancestral dessert plates (#S 595) are quite handsome indeed. Each are marked on the back and also each has the Minton imprint. The brown-red transfer decoration of flowers and leaves is painted with turquoise and pink enamel to accent the flowers. 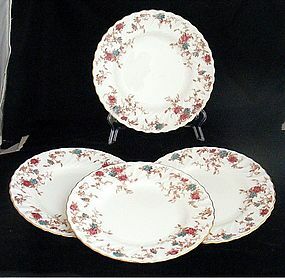 Each plate is trimmed in gold and is in excellent condition. Measures 7 7/8" across the scalloped rim. Production dates: 1944-1976. Book price $45.00 a plate.